It has to be said that we launched into researching “the nature and variety of seaside entertainments and performers” with great enthusiasm, but almost immediately faced a major hurdle. We arranged to meet ‘Uncle Tacko’ who created and ran the last Pierrot troupe to ever grace the beaches of Britain. 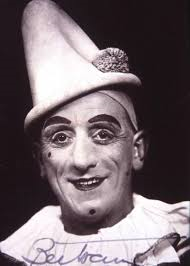 His knowledge of the Victorian Pierrot groups was comprehensive and lucid, but then he pointed out that it was all part of an oral culture with very little having been actually written down, let alone recorded or filmed. As our brief was also to ‘locate archive sources’ we realised that the task might well prove impossible. Legwork was needed and so we began a tour of Coastal Tendring. It proved to be exciting and illuminating, taking us into a medieval house, to a private collection of Victorian photographs handed down from father to son, into more than one pub and to a secret cupboard that proved to be a veritable ‘Aladdin’s Cave’ of memorabilia. However, perhaps the biggest benefit of all the legwork was that it also allowed us to build a network of knowledgeable and enthusiastic contacts that may prove invaluable in the final delivery of the project. The local history societies were a first resort and proved to be extremely helpful. Norman Jacobs at the Westcliff theatre, was an invaluable source of information and so was David Whittle at the Harwich History Society. David Batty, whose father was a beach photographer, has allowed us to use his own photographs although they are not for public distribution. We also found many other people who were more than happy to volunteer information and there was an exciting moment when we discovered a hidden treasure trove of old posters from the period in a forgotten room in a Theatre that we can’t name. Peter Watts, one of the staff of Clacton Pier, allowed us into the now derelict theatre on the Clacton Pier that once thrived as the “Jolly Roger”. It was a ghostly and strangely evocative experience to stand inside the rotting shell of a building that had been filled with so much enjoyment and laughter. 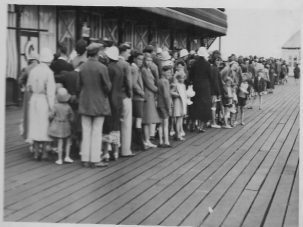 He also gave us access to the Kingsman’s office – a major figure in the development of Clacton and the past owner of the pier – and recalled how Earnest, who purchased the pier in 1922, and his wife would count the cash at the end of the day overlooking the crowds below. It was easy to imagine how things really were in the not so distant past. Moreover our contacts did provide us with some insights that could not be found in reference books. For example, it is generally assumed that foreign holidays sounded the death knell of coastal resorts, but a conversation with the granddaughter of Earnest Kingsman, gave Mandy a different insight. She said that it was the electrification of the railways that caused the decline of seaside entertainment. Prior to the electrification, people went to the coast and stayed overnight, but because of the electrification the tourists became mainly day-trippers. 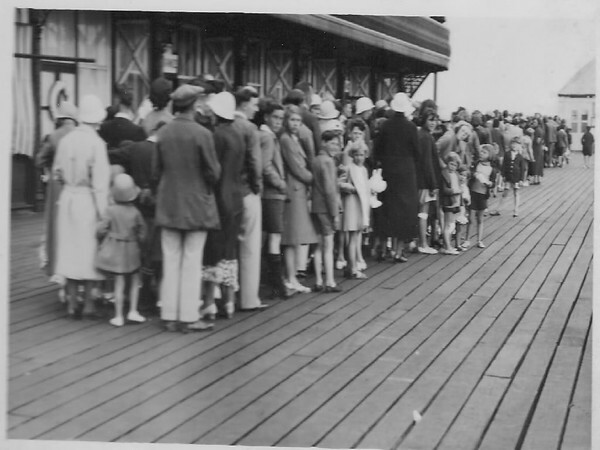 This in turn meant that there was no longer a demand for evening shows and therefore prompted the closure of the theatres on Clacton’s pier. We also went back to Uncle Tacko who had a beautiful collection of old postcards depicting pierrot troupes and some of the early Victorian seaside entertainers, which we dutifully ‘nicked’. The truth is that these ‘colourful’ troupes – or perhaps I should say flamboyant as their costumes were black and white – were iconic and so they were the best documented of all the seaside entertainers, with the exception of perhaps Punch and Judy. However, we didn’t dwell on Mr Punch and his wayward behaviour nor on the high divers and escapologists, as they were very much a sideshow. 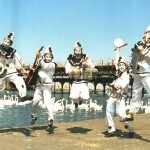 The real superstars of the Victorian Seaside were the troupes of performers who provided the tourists with live outdoor entertainment. For this reason we have focused on the entertainers and shows who brought the coastline to life and whose legacy can still be found in places like the Westcliffe Theatre, the story of which began with three entertainers from London busking on the very spot where the stage now stands. We also confined ourselves to live entertainment although it should be said that Cinema was intimately linked to the history of seaside entertainment. Perhaps the hardest challenge posed by the lack of documentation was tracing the history of the ‘Concert Parties’ that bridged the gap between the Pierrots and modern day entertainment. They were the real substance of the post Victorian seaside entertainment and we spent hours trying to find a clear definition but couldn’t! 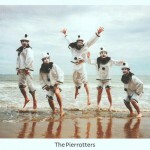 The term ‘concert party’ seemed to cover a whole range of entertainers including the Pierrots. One article entitled ‘The Neglected Art: Trends and Transformations in British Concert Party Entertainment, 1850-1950’ by Bernard Ince, became a prime guide to the intricacies of the development of the Concert Parties, although he also skirted around a clear definition of what they were! In the end studying the most successful and famous ‘Concert Parties’ in Clacton itself, gave us the best definition. Another refinement we made to the brief was to the dates. Seaside entertainment began to evolve around 1850 we so we felt that it was helpful to slip the frame of reference back in time, from 1890 to 1850. This allowed us to tell the full story and give both background and context to the development in Tendring itself. Indeed in Harwich it began with the arrival of the railways in 1854 and in Clacton and Walton with the completion of their piers in 1871. Equally 1960 felt slightly arbitrary for an end date for the research as the heyday of seaside entertainment on this coast began to dwindle in the post war years. It is true that Butlins and Warner’s Holiday camps came into their own after the Second World War, but we are aware that a large Heritage Lottery project was recently undertaken looking specifically at the history of Butlins. In view of this we have left the history of holiday camps to one side and followed the history of coastal entertainers from the original minstrels to the concert parties of the twentieth century, which eventually transformed into the seaside spectacular. Obviously the history of seaside entertainment is synonymous with the history of seaside resorts but we discovered that the creation of those resorts was in turn was part of the ‘Leisure Revolution’. 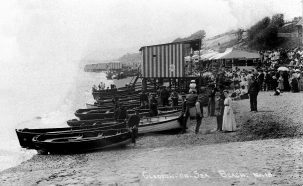 So firstly there we have written a section on the history of seaside resorts and how they developed against the backdrop of the industrial revolution, the aspirations of the burgeoning middle classes and of course the invention of leisure. This includes a look at the powerful hold the seaside had on the Victorian imagination, something that may be truly hard to comprehend in modern times. Following on from that section we look at the comparative development of the six coastal towns included in this research. This section naturally follows on from the first and explores the similarities and differences between the six resorts. In relation to the six towns it should be said that unavoidably Clacton-on-Sea became central to the research followed by Walton-on-the-Naze and Harwich. This is because it was pivotal to the development of the coast and at one time was the major resort with a veritable wonderland of buildings and folly’s that no longer exist. Walton-onthe- Naze very much followed in Clacton’s footsteps, while Frinton chose to go in a very different direction avoiding tourism as much as it could. The third section looks at the styles and genres of seaside entertainment that existed from the 1850s onwards but with specific reference to the main groups that existed in Clacton. It also explores the ways in which those developments have influenced modern culture, from pop music, to popular entertainment and of course the modern seaside variety show. It has to be said that the Pierrot troupes get the most detailed background thanks to ‘Uncle Tacko”! Having hopefully created the background and context in the first three sections we look at many examples of Notable entertainers and venues that existed in the coastal resorts of Tendring. This section has some fascinating tales such as that of Clown Bertram, a children’s entertainer from London who walked up to Earnest Kingsman, owner of Clacton Pier, and literally asked for a job. A couple of years later Earnest had build Bertram his very own theatre. Again we have opened up the brief a little at this point to include some venues, as we felt that extra-ordinary buildings and features such as the ‘ice house, Palace by the Sea’ in Clacton, or the “illuminated Electric Fountains’ were part of the entertainment landscape. 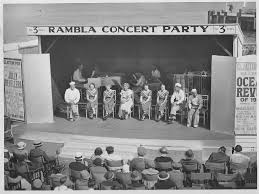 Finally there is a section on The ‘Ramblas,’ a concert party that worked on Clacton Pier, which has been sourced from a piece of work by Bernard Polley, a local man, who was more than happy to share his work with us. We were originally asked to present our findings theatrically and so intended to use a multidiscipline approach to presenting our work. Throughout this process, the mode of delivery has changed and our findings can now be found through this document, as well as a 20 minute documentary that follows our journey gives a vivid impression of the people and places we encountered. To request the full paper please click here. This piece of work was funded by the Heritage Lottery Fund. Thank you Eddie I will pass on his name to our local history society and find out what they know of Gordon Henson.